Welcome to my beadwork photo album! Beadwork is more than a hobby for me. It's a passion, the way I capture and celebrate life. In this album, I've assembled some of my favorite projects. This is a beautiful piece of Oregon jasper that Dad cabbed and gave to me. 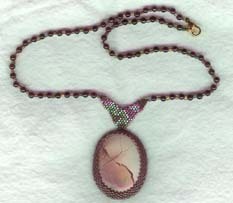 I beaded around it and then made the necklace using garnets. I'd love for you to sign my guestbook.